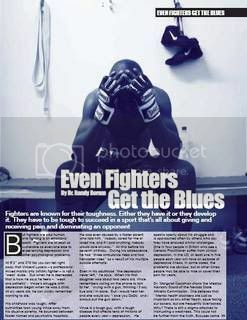 'Even Fighters Get The Blues' was first run in Issue 30 of Fighters Only Magazine. Fighters are known for their toughness. Either they have it or they develop it. They have to be tough to succeed in a sport that’s all about giving and receiving pain and dominating an opponent. But fighters are also human, and fighting is an emotional sport. Fighters are at least as vulnerable as everyone else to experiencing depression and other psychological problems. At 6’2” and 270 lbs you can tell right away that Vincent Lucero – a professional mixed martial arts (MMA) fighter – is not a ‘weak’ dude. But when he is depressed, that is how he says he feels – “weak and pathetic”. Vince’s struggle with depression began when he was a child. At six years old, he can vividly remember wanting to die. His childhood was rough. After authorities took young Vince away from his abusive parents, he bounced between foster homes and psychiatric hospitals. He was even abused by a foster parent who told him, “nobody cared for me or loved me, and if I said anything, nobody would care anyway.” All this before his seventh birthday. During his adolescence, he had “three ambulance rides and two helicopter rides” as a result of his multiple suicide attempts. Vince is a tough guy, with a tough disease that affects tens of millions of people every year – depression. He speaks openly about his struggle and is approached often by others who say they have endured similar challenges. One in four people in Britain who see a General Practitioner suffer from clinical depression. In the US, at least one in five people each year will have an episode of depressive illness. In some cases, the problems are obvious, but at other times people may be able to hide or cover their pain for years. Depressive illness (or clinical depression) is different than a normal period of feeling down after being disappointed or after something bad happens. The symptoms are worse, they last longer and there are more of them. It is not caused by a weak will or personality. It is a serious health condition that can ruin relationships, careers, and lives. Mike Tyson has publicly reported numerous bouts with depression, a condition he says he has battled all his life. Boxing great George Foreman is reported to have become severely depressed following his loss to Muhammad Ali. UFC fighter Frank Trigg, after losing his UFC 47 match against Matt Hughes, said he went into “a deep, deep downward spiral” that led to a “very severe…eight-month depression.” Even Fighters Only’s own heavyweight star Ian ‘The Machine’ Freeman has revealed that he is, in fact human, and had struggled with dark periods in his earlier years. It may be harder sometimes to spot depression in men than in women. Studies usually show that women are more likely than men to be diagnosed with depression, but many professionals and researchers believe that men get it just as often. They suspect that men may experience and show depression differently than women do. Depressed women’s moods are often sad and they may be prone to frequent bouts of crying. The mood problems of depressed men, though, often appear in the form of irritability and anger. Depressed men also may be more prone to have physical symptoms – unexplained fatigue, headaches, stomachaches, general soreness, pain and physical discomfort. Instead of appearing clingy or needy, depressed men tend to isolate themselves socially and try to keep their negative feelings inside. Some experts call it covert depression. One author calls it ‘Irritable Male Syndrome’. Guys may also be more prone to cover or escape from their depression by self medicating with drugs or alcohol or even exercise. Physical exercise may help as a short-term strategy, but for some it becomes a compulsion. They cannot seem to work out hard enough or long enough, even when they are injured or their bodies are telling them to slow down. Terrance Real, author of I Don’t Want to Talk About It: Overcoming the Secret Legacy of Male Depression says that men often harbour a hidden depression. “One of the ironies about men’s depression,” Real says, “is that the very forces that help create it prevent us from seeing it. Men are not supposed to be vulnerable. Pain is something we are to rise above.” Some see depression itself as ‘unmanly’ or associate it with feminine emotionality. As a result, friends and family may not see sadness and tears, “What you see are the footprints of depression or the defences a man is using to run from it.” According to Real, those footprints usually involve self-medication with booze or drugs, risk taking (like gambling, driving fast, or womanising), radical isolation and lashing out at others. Though studies show that about twenty percent of people will have at least one serious episode of depressive illness in their lifetime, some people are at greater risk than others. Many fighters seem to have backgrounds that are loaded with those risk factors –having been abused as a child, bad childhood relationships with their parents, childhood loss of a parent, marital / relationship problems, and low social support. Training and fighting may help some combat sport athletes cope with their negative mood states, but when depression goes untreated, it can also interfere significantly with athletic performance. Depression can disrupt concentration and focus. It can deplete energy levels and motivation. When people are depressed, they often are plagued by negative thoughts that can seriously undermine their confidence. Sleeping and eating patterns get disrupted. Motor skills and reaction times can slow down. It is a bad deal if you are competing or preparing for a fight. Few who saw it will ever forget watching former WBC heavyweight champion Oliver McCall as he refused to fight and began weeping during his bout with Lennox Lewis. Despite the risks, researchers say that most people with depression never get the help they need. Some cases go unrecognised, but other times people feel too ashamed to reach out for help. Without treatment, those who have one depressive episode, are much more likely to have another. The disease may get worse. Depression may take its final toll – collapsing the fighter’s spirit and casting upon the mind a seemingly boundless shadow of hopelessness. In the US, someone commits suicide every 16.2 minutes. Eight of every ten of them are men. A half million people in America and over 140,000 in England and Wales alone attempt suicide each year. The stakes are high, but there is good reason to be hopeful. Whether or not there is a ‘cure’, depression is very treatable. Success rates exceed eighty percent. Therapy helps many people. A new generation of medications are very effective and have far fewer side effects than the early antidepressants. They are non-addictive and typically do not cause people to feel out of it, just ‘normal’. If you think someone you coach or train with may be struggling with depression, experts encourage you to reach out. If you are worried they may be thinking about hurting themselves, they say it is OK to ask. You won’t ‘put the idea in their head’. The key, professionals say, is to listen, express your concern, and encourage them to seek treatment. Ignoring the hurt or dismissing it – for example, by saying ‘It can’t be that bad’ – or talking about your own problems just adds to the feelings of isolation. By being supportive and willing to listen, you may be the key to helping a friend or training partner win the toughest fight of his life. This feature was written partially in response to the death of IFL fighter Jeremy Williams. A fund has been set up to help support his family to which the author donated his fee for this article. to help the Williams family to this trust fund. to the Williams family to do so with full confidence and speed. Wow, I think that fighters get the worst blues and in a lot of cases the blues are the reason they got into fighting in the first place. There are countless studies showing how training martial arts can reduce depression and anxiety. This is how martial arts can change one's life. Why Should Fighters Care About Sport Psychology? Copyright - Dr. Randy Borum. Awesome Inc. theme. Powered by Blogger.